June 25, 2016 HockeyDraft.caLeave a Comment on 2016 NHL Entry Draft: How Did Canada’s Teams Do? 2016 NHL Entry Draft: How Did Canada’s Teams Do? With the first day of the 2016 NHL Entry Draft in the books from the First Niagara Center in Buffalo, it’s time to take a look at how Canada’s teams did. 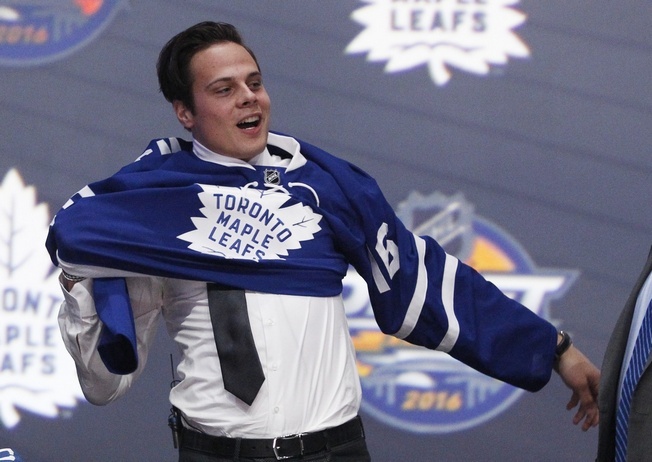 Unsurprisingly, the Maple Leafs selected Auston Matthews with their first overall draft pick. Matthews became the first American-born player to go first overall since Patrick Kane was selected by the Chicago Blackhawks in 2007. Matthews had been skating in Switzerland, as we discussed in our profile of him last September. He’d topped all the prospects lists then and very little changed, with the Leafs finally lining up a big top line centre. Matthews is 6’2, 216 pounds and he managed 46 points in 36 games with Zurich in the National League A. And he’ll be on Team North America at the upcoming World Cup of Hockey, so you can bet Toronto fans will be watching carefully. The Jets selected Finnish winger Patrik Laine with their second overall pick, which is pretty much in line with how Central Scouting saw things. The 6’3, 201 pound forward has earned comparisons to Brett Hull and has one heck of a one-timer. He helped Tappara win the championship in Liiga, putting together 15 points in 18 playoff games and earning the Most Valuable Player award for his post-season performance. Laine will play for Team Finland at the World Cup of Hockey. With the 18th pick in the first round, the Jets selected defenceman Logan Stanley from Windsor. In 64 games, Stanley had 17 points. He’s a left-shot blueliner and was paired with Sergachev for a big part of the season in the OHL. He’s a mobile defender, plus he’s the biggest defenceman in the draft at 6’7 and 224 pounds. The Oilers selected winger Jesse Puljujarvi from Karpat with the fourth overall pick. The Finnish forward is an all-around player with a knack for playing a power game. Scouts have him skating alongside Connor McDavid in the near future, which could create a significant one-two punch. Puljujarvi helped Finland to a gold medal at the 2016 IIHF World Under-18 Championship and led them to gold at the 2016 IIHF World Junior Championship, with a 17-point performance. The Canucks used their fifth overall pick to select Olli Juolevi, another Finnish skater. The defenceman has been skating with the London Knights in the OHL, where he put up 42 points in 57 games. Juolevi had nine assists in seven games to help Finland win gold at the 2016 IIHF World Junior Championship, plus he had seven points for London on the way to the Memorial Cup. He gives the Canucks a left-shot option on the blueline and has top-tier skating ability. The Flames picked Matthew Tkachuk with the sixth overall selection, snagging the winger from the London Knights. Tkachuk had 107 points in 57 games and can play in all situations. Scouts have said he’s reminiscent of Corey Perry, with top-quality hockey sense and a vision for the 200-foot game. He led the OHL with 20 goals in the post-season and has a nose for the net that should fit Calgary’s attack. The Flames also addressed a serious problem by acquiring goalie Brian Elliot in a trade with the St. Louis Blues. They coughed up a second round draft pick and a conditional draft pick for 2018 and earned themselves a starting netminder in return. Elliot has a year to go on his contract and should help the Flames correct their worst-overall save percentage. It’s an instant upgrade. The Habs picked up defenceman Mikhail Sergachev with the ninth overall draft pick. He skated with Windsor in the OHL and became the youngest recipient of the OHL Most Outstanding Defenceman. Sergachev led the league’s blueliners in goals and was third overall in points, with 31 power play points. Many believe he’ll be NHL-ready this season. The Canadiens traded for Andrew Shaw, sending two second round draft picks to the Chicago Blackhawks. General manager Marc Bergevin says he hopes to work out a new deal with the pending restricted free agent. They also traded forward Lars Eller to the Washington Capitals for second round draft picks in 2017 and 2018. The Senators traded their 12th overall pick to the New Jersey Devils along with a third round selection for the 11th overall pick. Ottawa used their selection to snag centre Logan Brown from Windsor. The playmaker is 6’6, 220 pounds and brings great hands to the game. The Senators believe he’ll be a top centre one day and liked him enough to trade one slot up to make sure. In 59 games with Windsor, he managed 74 points.